The Vols (22-1, 10-0 SEC) enter the matchup on the heels of a 73-61 victory over Florida on Saturday. The 10-0 start to league play matched Tennessee’s best start ever, joining the 1976-77 team. UT has won a program-record 18 straight games behind its experienced and talented roster. 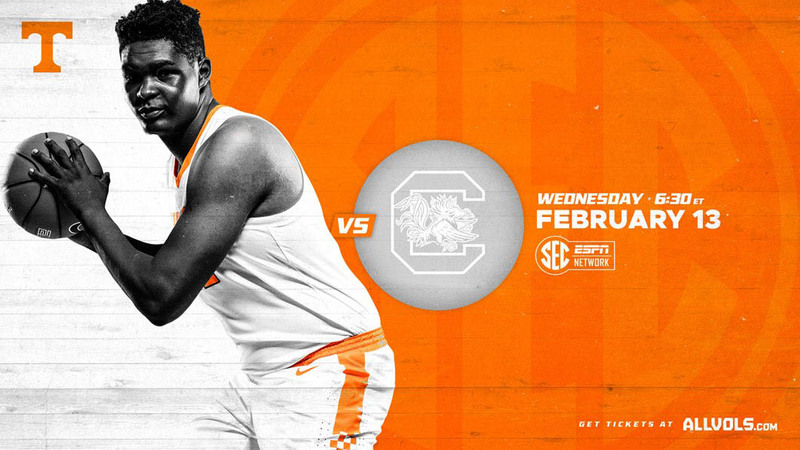 In SEC play, the Big Orange has defeated eight of its 10 opponents by double-digits as a result of its high-scoring offense and lockdown defense. Wednesday night’s game will be the third rematch in a row for Tennessee, who handled both Missouri and Florida with 12-point wins. However, South Carolina (12-11, 7-3 SEC) is playing its best basketball of the year since starting its conference slate, beating Auburn, Florida and Mississippi State. The Gamecocks brought back their best player from last year in Chris Silva (13.7 ppg, 7.0 rpg, 2.0 bpg), who was the 2018 SEC Co-Defensive Player of the Year and first-team All-SEC honoree. The senior forward went off for 28 points and 10 rebounds in the first meeting. Tennessee leads the all-time series with South Carolina, 45-27, dating to 1927. The Vols have won each of the last two meetings. The Vols have a 26-9 edge when the series is played in Knoxville. Tennessee has won three straight in the series, dating to last season. Extend Tennessee’s program-record win streak to 19 games (it’s also the longest win streak of Rick Barnes‘ 32-year head coaching career). Stretch the Vols’ home win streak to 23 games, dating to last season. Mark the first time the Vols have ever started SEC play 11-0. Make the Vols 8-1 all-time as the AP’s top-ranked team. Extend Tennessee’s program-record win streak in regular-season SEC games to 15 games. This week marks Tennessee’s 100th week occupying a spot in the AP top 10. Tennessee’s average home attendance of 18,600 ranks fourth nationally. At tipoff Wednesday, 82 full days will have elapsed since Tennessee’s last loss. The Vols have shot 50 percent or better 16 times this season and rank second in the country with a .516 field-goal percentage. Point guard Jordan Bone is directly responsible for 33.3 percent of Tennessee’s total scoring this season when you factor in his points scored and the points resulting from his assists. In SEC games, Tennessee averages a league-best 10.6 turnovers per game. The next closest team (Kentucky), averages 11.9 tpg. Seniors Kyle Alexander, Lucas Campbell, Admiral Schofield and Brad Woodson have just four home games left in their careers. South Carolina has been one of the biggest surprises of SEC play this season. The Gamecocks (12-11, 7-3 SEC) struggled during non-conference action, but head coach Frank Martin’s team has it rolling in league play. South Carolina boasts conference wins over Auburn, Florida and Mississippi State. Carolina played a tough non-conference slate, with games against Clemson, Michigan, Oklahoma State and Virginia in order to get ready for league play. The Gamecocks brought back their best player from last year in Chris Silva. The 2018 SEC Co-Defensive Player of the Year and first-team All-SEC honoree is averaging 13.7 ppg, 7.0 rpg and 2.0 bpg. The junior forward is shooting 52 percent from the floor and has a knack for getting to the free-throw line, where he is 112-of-150 (.747) on the season. Freshman guard A.J. Lawson leads the team in assists (2.6 apg) and steals (1.1 spg) and is second in scoring (13.7 ppg). He’s joined by redshirt senior guard Hassani Gravett (10.7 ppg, 2.3 apg) in the backcourt. Gravett has been the team’s leading threat from beyond the arc (42 3FG; .400 3FG%). South Carolina also has a versatile performer in junior forward Maik Kotsar (8.0 ppg), who is second on the team in rebounding (5.0 rpg), blocks (1.1 bpg) and steals (1.1 spg). Despite a push from the Gamecocks in the second half to make it a one-possession game, No. 1 Tennessee pulled away in the second half for a 92-70 victory on Jan. 29, 2019, at South Carolina’s Colonial Life Arena. The victory marked the 15th consecutive win for the Vols, matching a program record that has stood for more than a century (Feb. 20, 1915, until Jan. 20, 1917). Tennessee’s defense stepped up big in the final nine minutes of the game, holding the Gamecocks to just seven points and 1-of-10 shooting from the field down the stretch. During that span, UT was able to use a 19-6 run to secure the 22-point victory. The offense was firing on all cylinders Tuesday, connecting on 56 percent (36-of-64) of its shots from the field. Tennessee’s 92 points were the most allowed by the Gamecocks in a game this season. The duo of Admiral Schofield and Grant Williams posted a dominant performance, finishing with 24 and 23 points, respectively. Schofield added nine rebounds, four assists, two blocks and a steal, while Williams finished with nine rebounds and four steals. The pair helped UT hold a scoring advantage in the paint (42 to 22) and an edge on the boards (39 to 31). Jordan Bone had an impressive game at the point, dropping 19 points and dishing out nine assists to fuel the offense. Lamonté Turner chipped in 13 points behind three 3-pointers, three assists and two steals. On December 6th, 1969, unranked Tennessee strolled into Columbia and upset the No. 1-ranked Gamecocks, 55-54, thanks to 20 points from Jimmy England, and double-doubles by Don Johnson (18 pts, 12 rebs) and Bobby Croft (12 pts, 13 rebs). A two-overtime thriller in Columbia saw South Carolina pull out a 111-107 win on February 10th, 1993, despite 20-point efforts from Allan Houston (29), Lang Wiseman (26) and Corey Allen (22). Wayne Chism scored 23 points, JaJuan Smith added 19 and Tyler Smith had 13, but it was Chris Lofton’s 25-footer with 12.0 seconds remaining that lifted the Vols to an 89-87 win over South Carolina in the 2008 SEC Tournament in Atlanta on March 14th, 2008. 2011 first-team All-SEC guard Scotty Hopson had a bright career against South Carolina, owning a sterling 6-0 record against the Gamecocks. Hopson threw down a posterizing dunk in the 2011 Knoxville win that placed fourth in the CBS Dunk of the Year Contest. Tennessee is riding a program-record 18-game win streak. It is the longest active win streak in Division I.
Tennessee’s 22-game home win streak is the second-longest active streak in Division I. Houston has won 32 straight at home; Buffalo, like UT, has won 22 straight. Tennessee has won its most recent regular-season meeting against 12 of 13 SEC opponents. Auburn is the only team to hand the Vols a loss in its last clash, as the Tigers earned a 94-84 win on Jan. 2, 2018. Tennessee plays at Auburn on March 9. National Player of the Year candidate Grant Williams has dozens of noteworthy statistics and accomplishments this season, but here is one the most impressive. Williams has successfully converted on 26 of 26 “and-1” attempts. If he’s fouled on a made basket, the resulting free throw has been automatic. His season-high for and-1 conversions is three. He’s gone 3-for-3 in wins over Louisville, Wake Forest and Vanderbilt.